Home » Geography , GK by Pictures , World GK » Which Sea is without a Coastline ? Sea without a Coastline is one of frequently asked question in various exams. The Sea without coastline is Sargasso Sea. The Sargasso Sea is in the middle of the Atlantic Ocean, between the West Indies and the Azores, covering some 2 million square miles (3 million sq km). It is bounded on the west by the Gulf Stream; on the north, by the North Atlantic Current; on the east, by the Canary Current; and on the south, by the North Atlantic Equatorial Current. This system of ocean currents forms the North Atlantic Gyre. All the currents deposit the marine plants and refuse they carry into this sea. The Sargasso Sea is 1,100 km wide and 3,200 km long. Bermuda is near the western fringes of the sea. The water is exceptionally blue, with a high salt content. 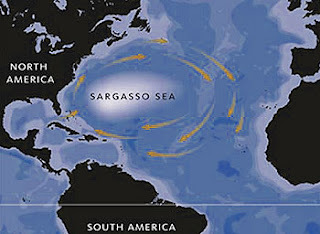 The Sargasso Sea is also known as “the floating desert”. Although about one-third of the Atlantic’s plankton is produced here, the Sargassum lacks the nutrients to attract commercially valuable fish. But many small marine animals, including tiny crabs, shrimp and octopuses, live on and among the sargassum, the rootless weed. Q. Which one of the following seas is without a coastline ?